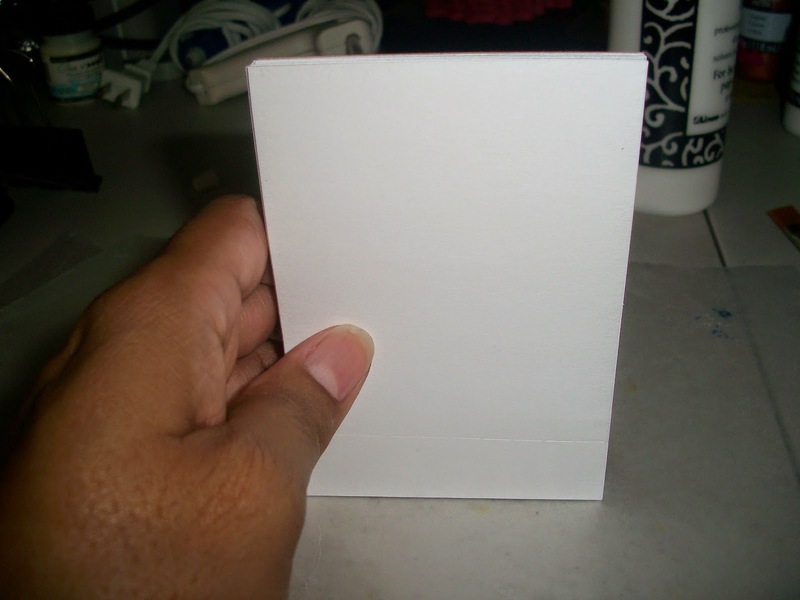 Part I of this tutorial is for making a basic notepad which can be made from scrap copy paper (which I use at work to be greener using paper from misprints or printouts which would normally end up in the trash). Part II will be for making a matchbook style notepad. PVA adhesive (approximately $16 for 8oz bottle) dries to a rubbery and flexible adhesive as seen in commercially manufactured notepads. 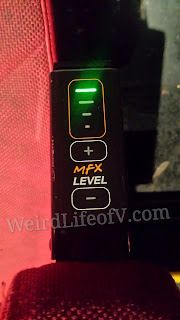 It enables easy removal of used pages while keeping the rest of the pad intact. 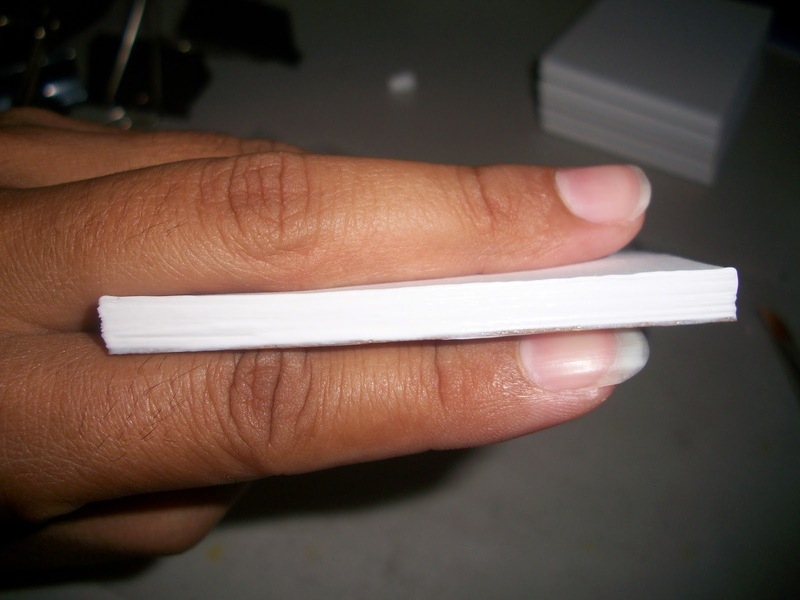 An 16oz bottle will enable you to make thousands of notepads this size. Cut your chipboard and paper to size (3” x 4 ¼” in this case). I have used 50 pages per pad making the notepads approximately ¼” thick. I used the perforation blade which came with my YourStory Rotary Cutter to make perforation lines at ¾” of each page. This is very time-consuming and is completely unnecessary if you aren’t covering the notepad. Carefully align your chipboard backing and pages, then apply a small line of PVA glue across the edge. Evenly spread the PVA with a small paint brush. 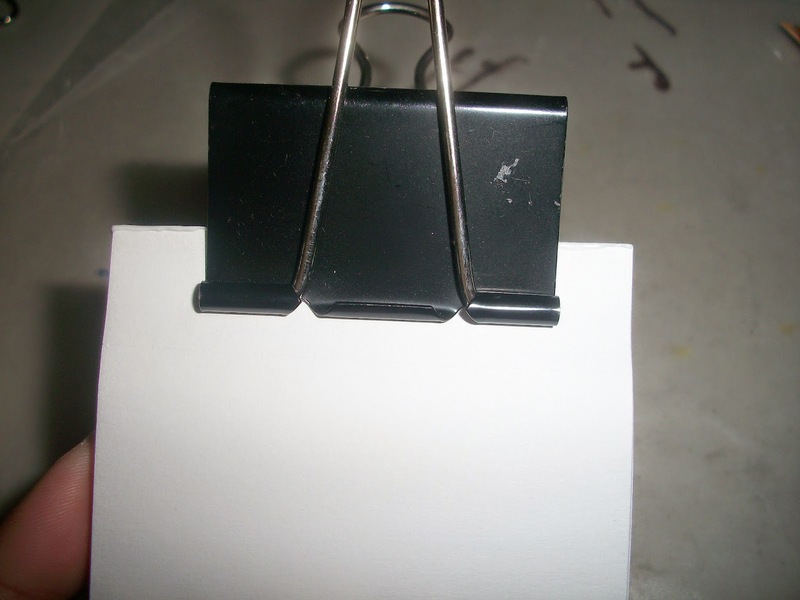 Carefully, place a large binder clip on the glued edge, taking care not to get glue on the clip itself. Allow glue to set according to the manufacturer’s instructions (usually about 4 hours). If you aren’t covering the notepad, I suggest adding an extra piece of paper to the front and back of the notepad which can be removed after the PVA has set. This is give you a cleaner look in case any adhesive has overflowed onto the edges. There are so many possibilities for these. I've been making them for use at work for years. We waste so much paper so I began to cut the paper in quarters (4 pieces per sheet) and using a standard office stapler to make them into a pad. These are perfect for jotting down information while on the phone, and I feel better using the paper a second time. I've made photo notepads as gifts for friends. Using Microsoft Word, you can lighten the saturation of the photo (I have ZERO photo editing skills), and print a lightened image directly onto the pages for your notepad. You could also use favorite movie quotes, song titles, inspirational quotes. The possibilities are endless. See Part II for making this pad into a matchbook-style notepad. There are two little munchkins who I adore, and are the daughters of dear friends. The past 3 or so years, I have made the invitations for their birthday parties, and some other decorations, favors, or whatever needs to be made. 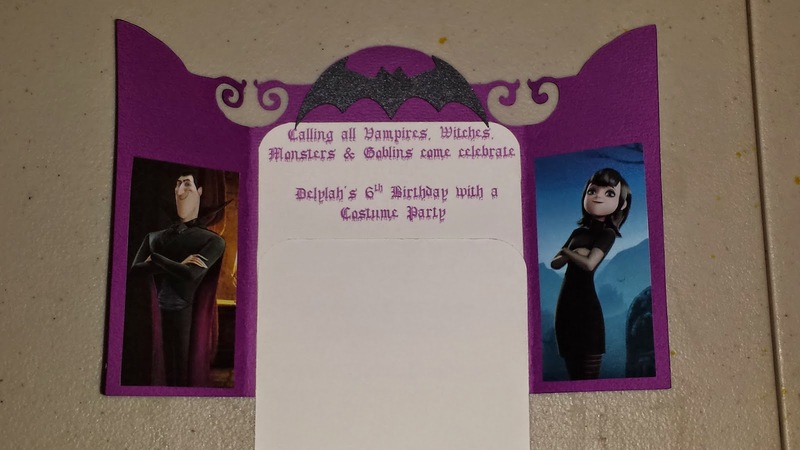 Last year Munchkin Number 1, wanted a Hotel Transylvania themed birthday party. Since her birthday is in October, her parents decided to make it a costume party complete with a haunted house (which the Munchkins, nor I, would enter). Here is the Invitation I made for that party. The card was cut using Cricut Over The Hill Cartridge at 5 1/2"
The gate and bat are Recollections black shimmer cardstock. The bat is cut from Cricut Batman cartridge (I can't remember the exact name, sorry) on page 33 at 3 1/3"
and attached using an adhesive foam square to add dimension. The information was printed on Recollections white cardstock with 2 different fonts since her mom and I couldn't decide on one. These felt bats were handcut using a free clipart image as a template. I glued googly/wiggle eyes (obtained at the Dollar Tree), then applied these to black tote bags which I had leftover from another party a few months prior. These were used as the party favor bags. Felt Bats ready to be applied to bags. I cut a bunch of circles in two different sizes from craft felt, by hand, then glued the pieces together and added googly/wiggle eyes. These were then glued onto those snap-type barrettes (purchased at the Dollar Tree). These were spread out on the tables at the party for guests to wear in their hair. The banner was cut using the Cricut Over The Hill cartridge using the same paper as the invitations plus a gray for the overlay. The letters were cut using the Cricut Mickey and Friends cartridge. The chandelier was cut using a Cricut Summer in Paris cartridge 3D option at the largest size I could get on a 12x12 sheet. The cardstock is a heavy black glitter on one side and plain white on the other. I cut the two pieces required for the 3D effect, then used the "flip" option on the Cricut machine and cut two more pieces. I matched the pieces and glue them together so that all sides would have the black glittler. I hung these using a wire spring which I made using .22 gauge floral wire I had on hand. I wrapped the wire tightly around a wooden dowel I also had on hand. I liked the bouncy/floating movement they had. Step 2: Scrunch the links/rows together tightly, twisting the links around the dowel if necessary. The glitter foam bats on the ends of the birthday banner were purchased at Michaels. I made 50 of these invitations for one of the munchkin's birthday party. I saw something in Pinterest, but there was no link to a tutorial, just the image. All paper is by Recollections unless noted otherwise. Yellow Cardstock Base: cut to 4"x11"
Blue Cardstock: Bottom strip - 4"x1", Squares - 2"x2", Straps - 3/8"x2"
Black Cardstock: Cut to 1/2"x 4 1/4"
Silver Shimmer Cardstock: Cut at 1 1/2"
White Cardstock: Cut at 1"
Brown Cardstock (Core'dinations brand): Cut at 1/2"
The card folds at the top and measures 4"x5 1/2" when folded. I had to eyeball the pieces for the overalls, so they aren't very centered, but making 50 of these was quite an undertaking. I drew the smile with a black Sharpie. I had glued the eye pieces with a liquid glue, which caused a bit of warping. I used my ATG to attach the blue pieces, then place all of the invitations under heavy books to flatten them out. I thought about doing more, but I need to get these to the parent's of the birthday girl and cost was also an issue. I have several projects I'm doing for this party, only a few of which are completed at this moment, so I need to be careful with my spending. These necklaces are being included in the favor bags for the birthday of a dear friend's daughter, who will be turning 6 next month. 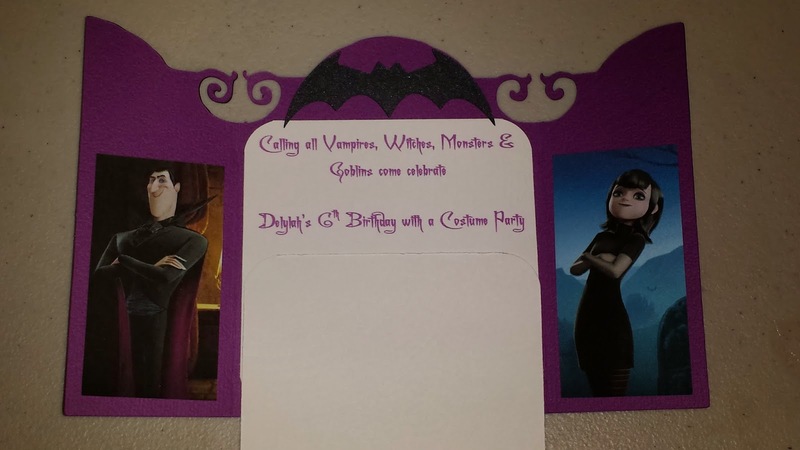 Her theme is Despicable me, specifically the Minions, and I posted the Minion Coloring Books I made for the party last week. 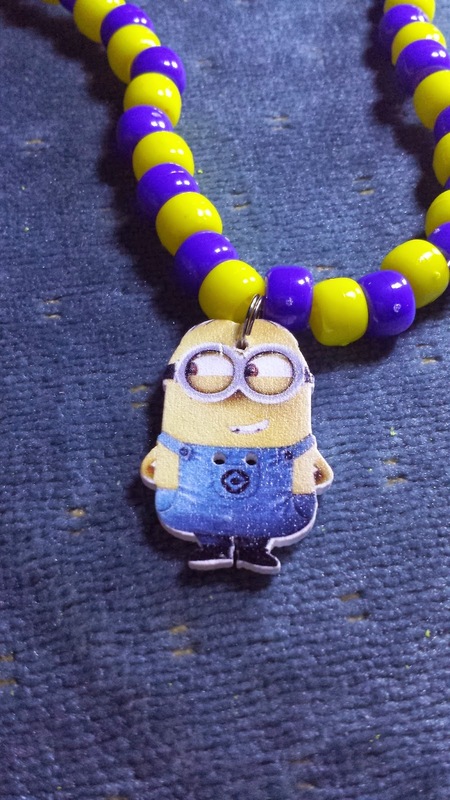 I will be posting more Minion party related crafts in the next couple of weeks, I'm sure. I'm also planning a Hunger Games party, and will have posts related to that party soon, as well. Optional: some sort of pendant ( I used wooden Minion buttons purchased on eBay which I drilled tiny holes at the top of for use as pendants). The overall length of the necklace is approximately 18" not including the pendant. I alternated the bead colors and triple knotted the cord and made sure it was tight. Trim the excess cord and attach pendant if desired. I used 8mm split rings to attach the buttons to the necklace. 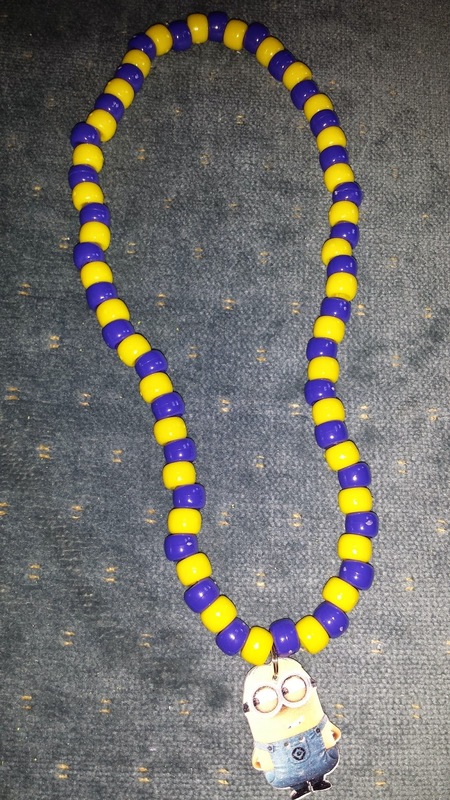 I also made some bracelets using these same beads and elastic cord, but without the pendant. I have made 2 sizes for the kids, and will probably make some larger ones for any adults who may want them. For the smallest size I used 10 beads of each color; the next larger size (which I'm calling "medium") I used 12 beads of each size; and if I make the adult/large size I will use 13 or 14 beads of each color. 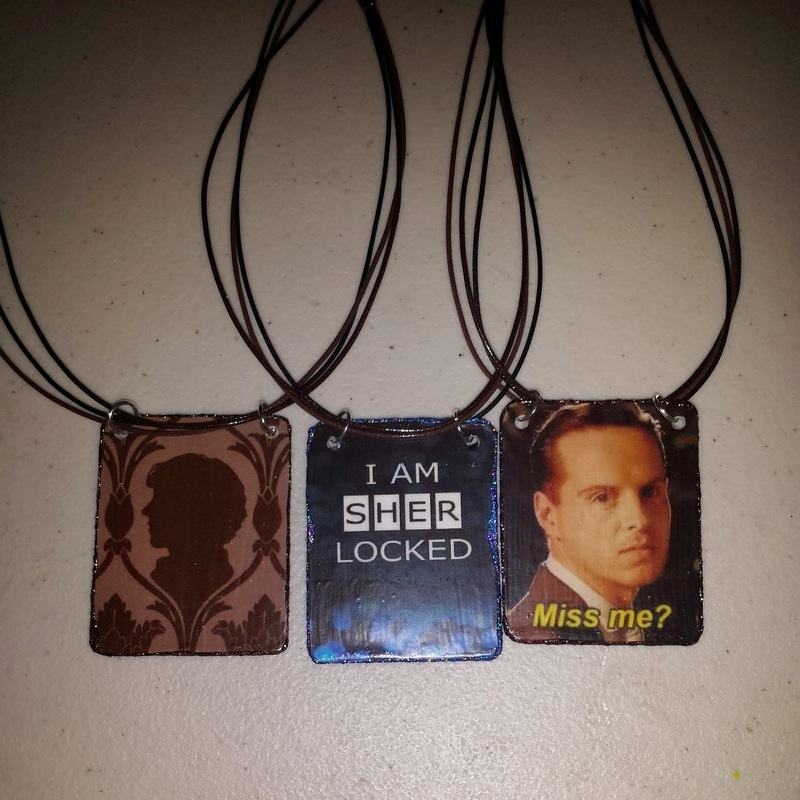 Upcycled Gift Card Pendants - Sherlock Style! I made a bunch of these pendants based on BBC's Sherlock to give out during San Diego Comic-Con (which I ended up not having time to do with all of the stuff going on during the Con.) I try to be eco-friendly so I'm always interested in ways to upcycle various items. Photos of your choice or you can paint if you are artistic. Step 2: File or sand down the cut edges and round out the corners (the corners can be cut with a heavy duty corner punch). I used cheap paper nail files purchased at the dollar store since they're cheap and were easier to work with. If you are going to paint on the cards, use a fine sandpaper on the surface you wish to paint on and skip Step 3. Step 4: Apply your photo onto the modge podged side of the card, or paint your image onto the card. Step 5: Trim the photo to size. 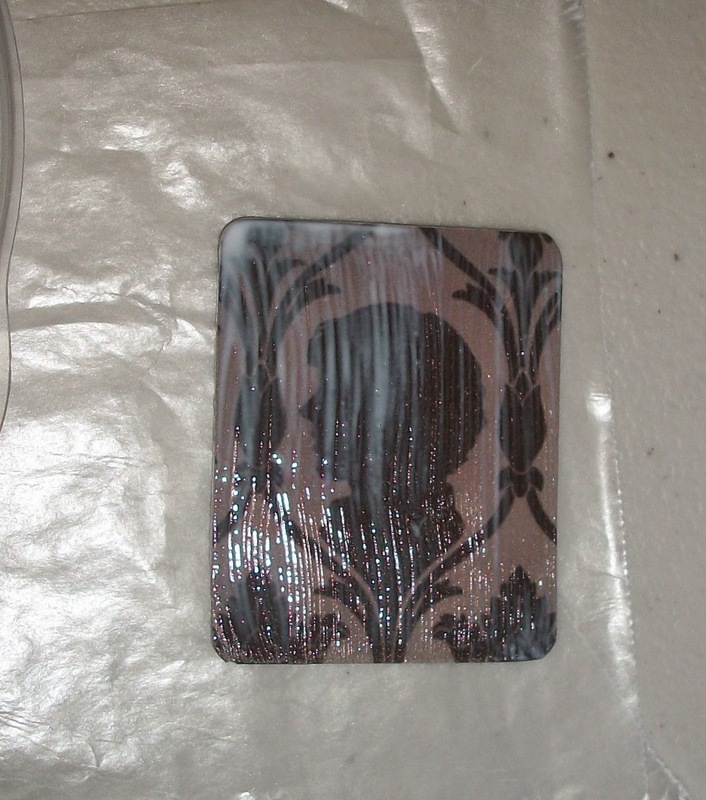 Step 6: Add at least 2 coats of Modge Podge to protect the image, letting each coat dry between applications. I don't have pictures for the rest of the steps. Step 7: I didn't want the backside to show the gift card so I used some scrap flannel fabric I had and used the same Modge Podge technique to attach the fabric to the backside of the pendant. I didn't coat the top of the flannel because I wanted the pendants to be soft against your skin, and Modge Podge can feel tacky against your skin. Step 8: Punch two holes in the top of your pendant, spacing determined on how long your necklace is and how you want it to sit. I used a 3-cord faux leather necklace which measured 17" long (not including the extender chain), and because it's short, I try to space the holes closer to the center of the pendant rather than the corners. Optional: After punching the holes, I applied one more coat of Modge Podge to the surface of the photo to seal the holes. Step 9: Attach the rings and necklace. Optional: I also used cheap ($1 bin at Michaels) glitter glue on the edges of the card to make it prettier and seal the flannel edges. The finished product! This picture was from the first attempts before I realized I preferred the holes closer together. 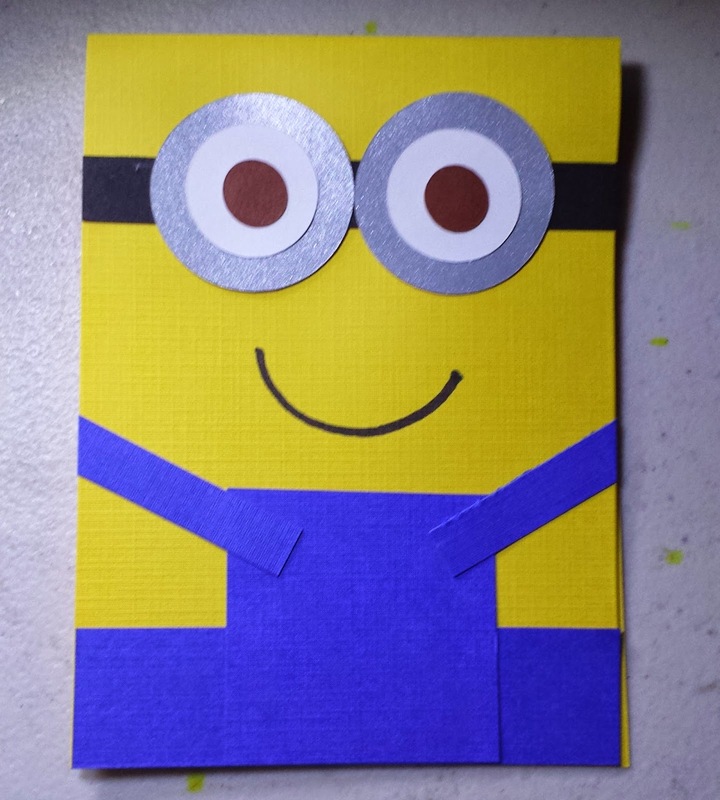 I'm currently planning and crafting for a Despicable Me themed birthday party a friend's soon-to-be 6 year-old daughter. She favors the purple minions, but there is some difficulty finding much of them anywhere, so I'll be making some purple minions for her. Here are the coloring books I made as favors. The cover is a 8 1/2 x 11 golden yellow cardstock made by Recollections and sold in mult-packs. I have a long-arm stapler which I used to bind the cover and pages together. The black strip is basic black cardstock (Recollections 8 1/2 x 11 pack) cut into 3/4" wide strips. I cut strips 3/4"x 5 1/2". I used a cheap tacky glue to attach the black strip and eye pieces. The eyes are made from 3 circles cut on my Cricut Expression using the Plantin Schoolbook cartridge Circle shape (page 72). Brown - 1 1/4" Core'dinations cardstock Chocolate Lovers multi-pack. The pupil of the eye and the smile was made by hand with a black Sharpie pen. Because of the thickness, the interior pages stick out slightly from the cover so I trimmed approximately 1/8" from the open end of the books using a heavy-duty board shears which I happen to have at work. You could always trim these by hand or leave as is. The photo above was taken prior to trimming the pages. 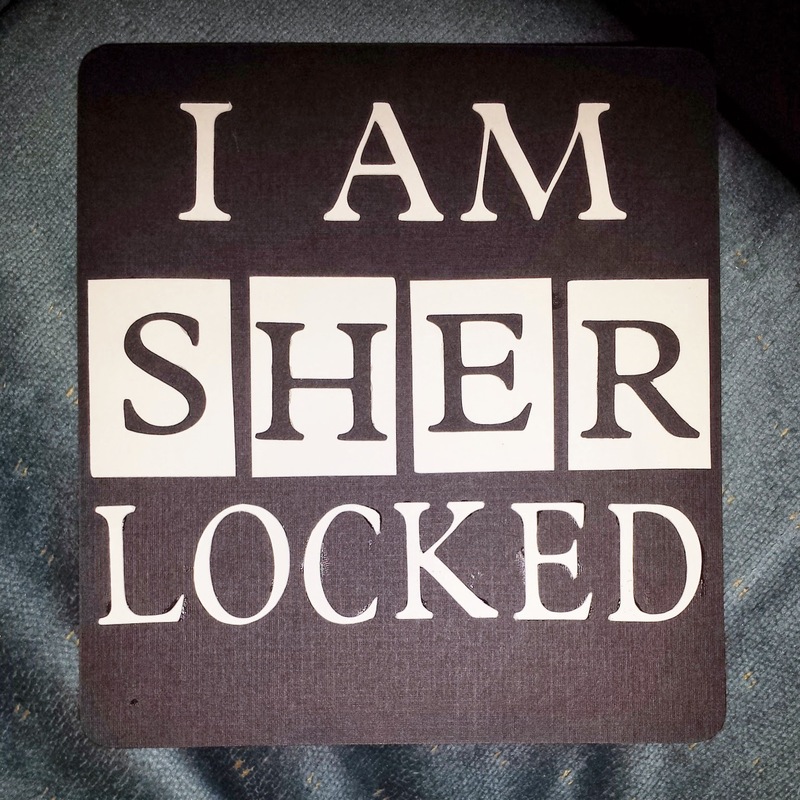 I recently attended SherlockeDCC in San Diego during San Diego Comic-Con. 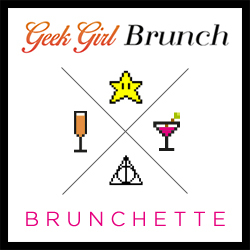 SherlockeDCC is a fan run party and more information can found here. I volunteered to make some goody bags which were inserted into the main swag bags given to each attendee. Inside each bag I made was a fan, charm, and a bookmark all handmade by me. I made 475 bags, and it was a lot of work, almost overwhelmingly so. All in all, I would say it was worth it. Below are samplings of a few of the fans I made and some basic instructions. All the fans were made using a base made from old DVD backer cards from rental stores such as Blockbuster which I purchased off eBay. These measure 5 1/2" x 8" and I cut them down shorter from 8" to 6" to get better mileage from standard scrapbook paper sizes. I used the Scotch Quick Dry paper glue for all the pieces, but I used hot glue to attach the handles. I used 8" wooden sticks for the handles which were also purchased on eBay (I'm a bit addicted to eBay). Most of the shapes and lettering were cut on my Cricut Expression. The violins were cut using the Violin (shift) option on the Quarter Note cartridge (Speed - Medium (2); Pressure - High (3); Blade setting at 4). 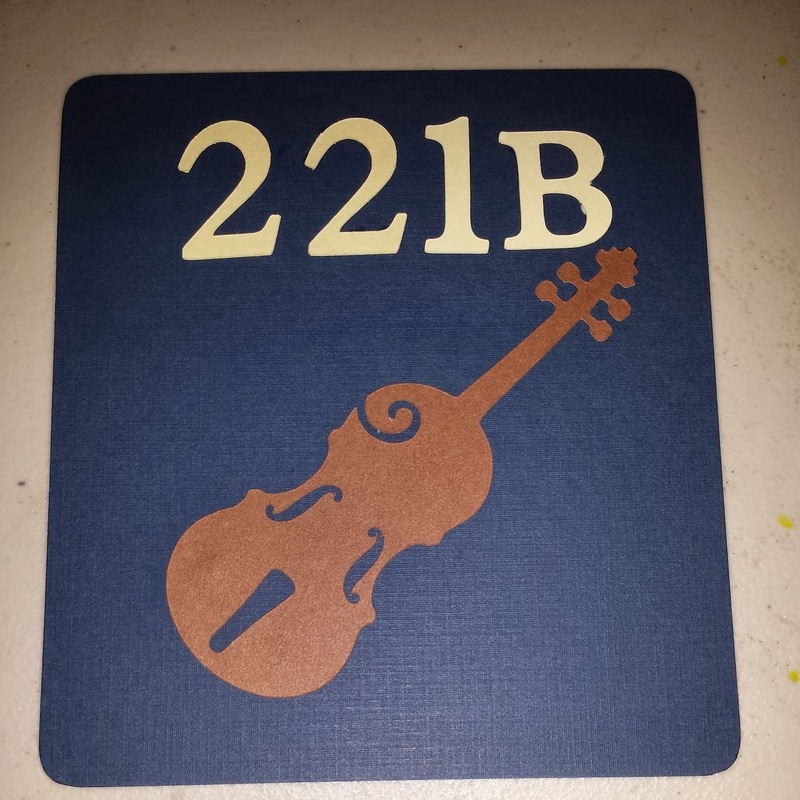 The "221B" were cut using the Plantin Schoolbook cartridge, but I forgot to note the sizes and settings. 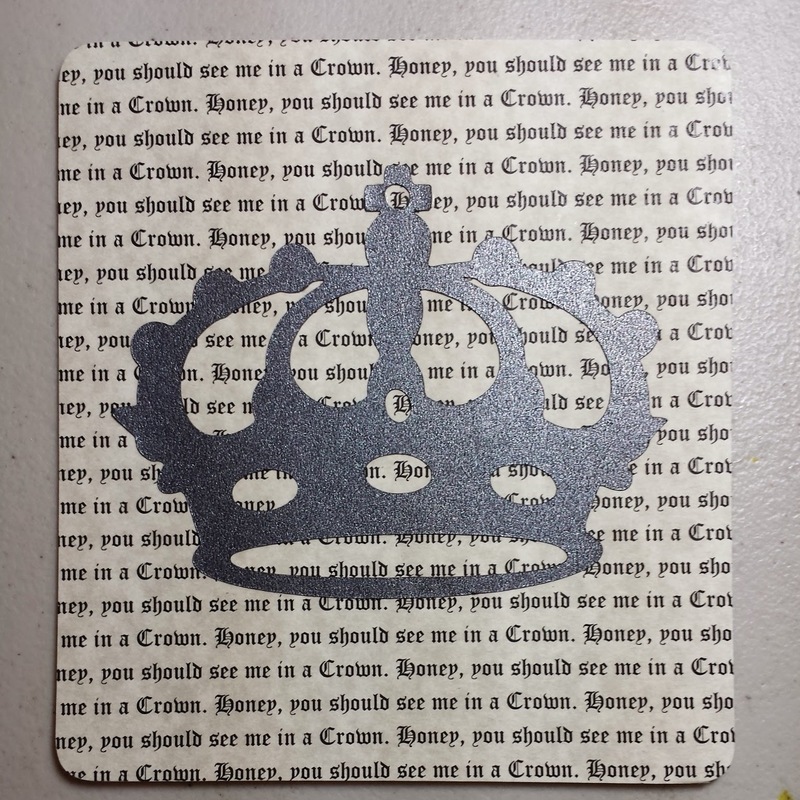 *The Core'dinations brand paper in the multi-packs is horrible to use on the Cricut. It doesn't cut very cleanly and I wasted so much time and paper trying to get the violins to cut. 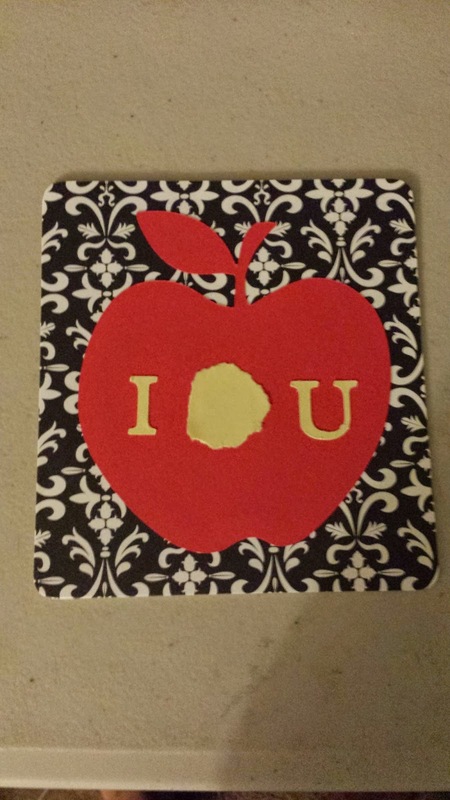 The apple was cut with the Plantin Schoolbook cartridge using the Roly Poly option at 5"
Letters "I" and "U" were cut using the Plantin Schoolbook cartridge in Upper Case Shadow at 1"
"I AM SHER" cut all upper case "regular" at 1 1/4"
"LOCKED" cut all upper case "Tall Ball" at 1 1/4"
Background: Printed repetition of Moriarty quote "Honey, you should see me in a crown" on beige paper. Crown cut using Rock Princess cartridge; Crown1; layer 7 at 3 1/2"